Soldiers are shown in a scene from the movie "Dunkirk." The Catholic News Service classification is A-III -- adults. The Motion Picture Association of America rating is PG-13 —parents strongly cautioned. Some material may be inappropriate for children under 13. NEW YORK — “Wars are not won by evacuations,” British Prime Minister Winston Churchill famously observed. 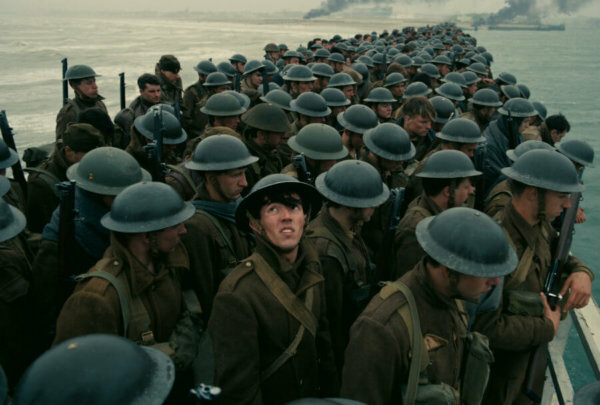 As writer-director Christopher Nolan’s compelling historical drama “Dunkirk” (Warner Bros.) demonstrates, however, fine films can be made about them. Up in the skies, a duo of RAF Spitfire pilots — Collins (Jack Lowden) and his higher-ranking comrade, Farrier (Tom Hardy)— battle the German fighters and bombers seeking to wreak havoc on both the hapless soldiers and the shipping below. The perils of the desperate, against-the-odds operation are fully exploited for dramatic tension, with near-death experiences awaiting almost every character. The measures resorted to by some of them in their efforts to survive seem questionable—at least as viewed from a comfortable theater seat.